Times like this, I definitely wish I had the money to spend to up and go travel because I would have loved to be apart of history. On December 12, 2014, the Millions March in New York City started in Washington Square Park to protest the killings of black people by the police force. From the first slaves that arrived in 1619 to once John Punch was sentenced to slavery for the rest of his natural born life for committing the same crime as two white peers, this country has always failed us as a people. It has been about 149 years since slavery has â€˜saidâ€™ to end in 1865 and yet African-Americans are still slaves to the justice system. A protestor holding a sign during the Millions March with the saying #BlackLivesMatter. It is 2014 and we are having a present day Civil Rights movement that is so disgusting because we still have to fight harder and harder everyday to just be heard. Itâ€™s very disappointing that in this day and age we have to still acknowledge the fact that we deserve equality. We should not have to put on a huge march, scream, and hold up banners telling other Americans that #BlackLivesMatter. to my people, I canâ€™t help but think, â€œa system canâ€™t fail those it wasnâ€™t built to protect.â€ This semester in my HistoryÂ 1 class I definitely learned a lot more about my history and everything makes more sense of what is going on in todayâ€™s time. Weâ€™re still slaves in America. We were stolen, brainwashed, and seasoned to â€œfitâ€ what they wanted us to be in there society. BUT Iâ€™m not going to start preaching and spilling all that Iâ€™ve learned this semester lol. A young man protesting shirtless and shoeless sheds a tear in the New York City cold during the march. 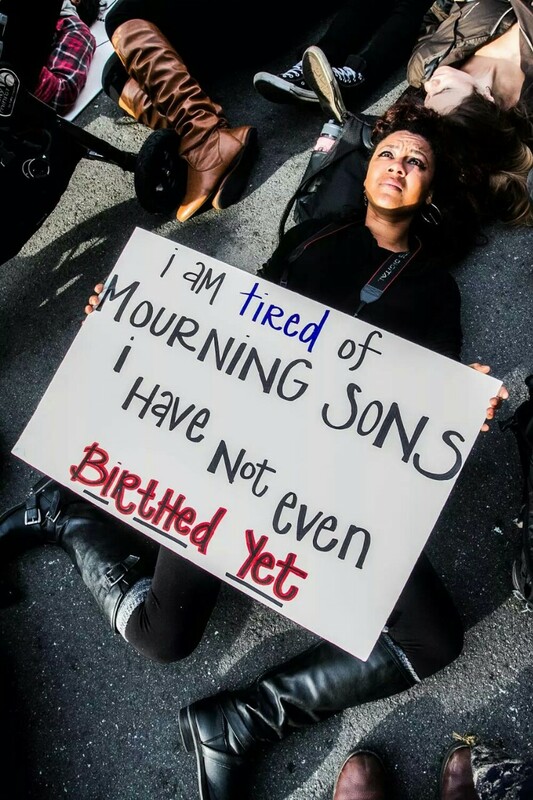 I really applaud all of those who participated in the march as it is still going on today (December 14, 2014). I really wished I could have been apart something as powerful as this because people are really trying to be heard in turning this system around. The most moving picture I saw was of a man shirtless with #PastorPresent written on his body with a noose around his neck. Out of all of the pictures Iâ€™ve seen online, this picture really touched my heart. It was said he walked from 2:00pm-7:00pm in the New York cold without a shirt and shoes. To me, it really gave the proper message to everyone, questioning on which time period are we really living in and we are not where we should be at all as a nation. Will we ever reach a point of equality? I honestly donâ€™t know because we are in such a bad place and we have been since forever. But I do hope that we get there one day because our people deserve it all.